Alaska Congressman Don Young tied the knot today, on his 82nd birthday. Young married 76-year-old Anne Garland Walton, a flight nurse from Fairbanks, this afternoon, in a little prayer room near the Rotunda of the U.S. Capitol. 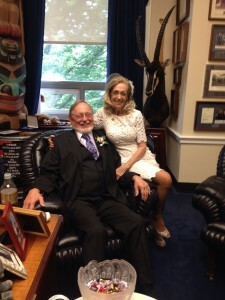 Later, at his congressional office, Young was smiling ear to ear, still wearing a pink rose in his lapel. Both bride and groom are parents and grandparents who were widowed, he in 2009, she in 2001. Walton, who will keep her last name, says finding each other was a gift from God. Marrying on Young’s birthday, on the other hand, was calculated. Young, meanwhile, did a little jig in the office reception area, because, he says, there aren’t many 82-year-old grooms, and fewer still who can dance on their wedding day.